The Rondo Bracelet is most striking if made in a two tone color combination. It has a presence and beauty on the wrist. The bracelet is ring intensive and can take a while to make, but the results are well worth the effort. This is an intermediate weave. The clasp is not included in the kit. 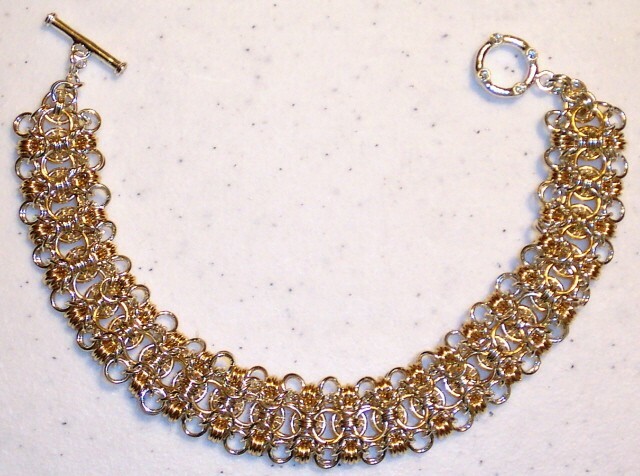 Rondo Bracelet Kit - Two tone Refill Kit - predominantly silver with yellow gold filled - instructions not included.